1. Your liner may have a split seam. 2. There may be a hole poked or ripped in your liner. 3. There may be a leak in your pipes. 4. There may be a leak in the face plates of the steps, skimmers or return fittings. 5. Your liner may have been attacked by ants or termites. In trying to find and correct the source of your leak, it’s helpful to look for the most common possibilities first and then to eliminate these possible problems one at a time. I will try to address each of these problems with a different post over the next few months. Let’s begin today with the least common of the potential problems: ants or termites attacking your liner. I have only seen this happen a few times in 30 years. It makes sense that these bugs, thirsty for water, come up through the ground and chew their way through the liner, causing leaks. These attacks seem to happen more in arid regions, regions with lots of termite activity, or in periods of drought when insects are desperate for moisture. I am told that if you look from the backside of the liner, you can actually see the “teeth marks” in the vinyl. I am also told that you can see the “trails” they leave in the sand or vermiculite floors, much like you would see in an ant farm toy. For many years, it has been known and proven that termites and ants will attack a vinyl pool liner. It is suspected that the termites are attracted to the pool area due to the dampness around the pool. Usually, the first signs are very small holes in the liner in the area above the water line. Quite often, the liner may have dozens of holes in it within a short period of time after they have begun their attack on the liner. Most of the time, if the liner is taken out of the bead track and pulled away from the wall, you may see the trails that the termites have left behind. Usually the holes they make in the liner are relatively small, about an eighth of an inch in diameter and are round or oval shaped. If the pool liner has to be replaced as a result of termites or ants, the homeowner is advised to get an exterminator to treat the ground beneath the liner and around the perimeter of the pool deck. Although this is not a widespread problem, it should be taken seriously. An average of ten to fifteen cases a year are reported to us. 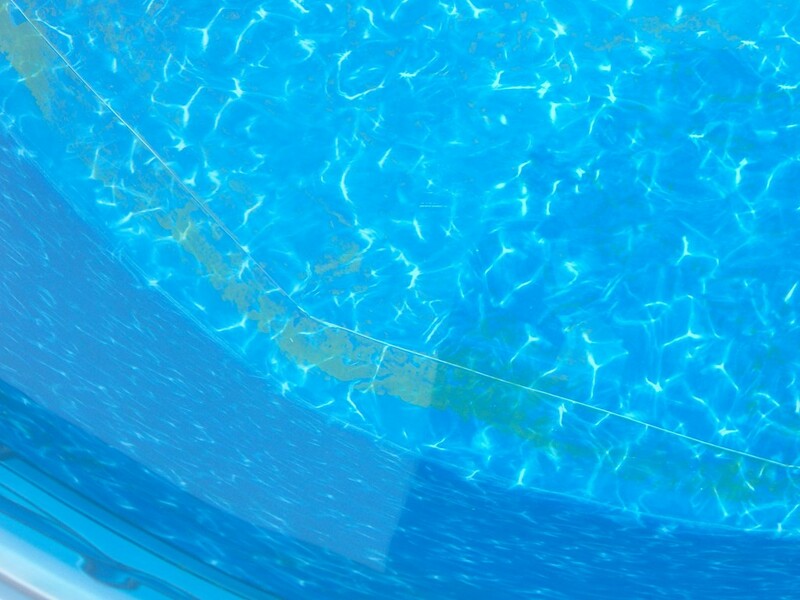 We often hear pool owners question whether they should be able to see the seams in their liner. The answer is yes. Every liner has seams, at least every six feet, and they are more visible on some patterns than on others. In the old days, when all patterns were on blue base film, you could not really see the seams since there was less ink coverage. Today, when most all patterns are on white base film, the seams are more visible, but the less ink there is, the less noticeable they are. We advise that you wait until the pool is filled before you worry about the seams. While they are always there, they are much less noticeable under three feet of water. The liner pictured below (pattern: Robertson) is a good example of visible liner seams on a properly manufactured liner. The seams on the floor are barely visible. The vertical seam is razor thin, perfectly straight and the tile is matched almost perfectly at the top. Pictured below is Morrison, one of our most popular patterns. If you look closely, you can see two liner seams in the shallow end of the pool. The Morrison pattern has one of the most visible liner seams out of all of our patterns. That being said, you will notice that the seams are barely visible, especially if standing 10 feet away and if the pool is filled with water. In the picture below, you can see a seam across the bottom of an unfilled pool (pattern: McDowell). Below, we present you with the McDowell pattern again in a pool completely filled with water. From this viewpoint, it is impossible to notice any liner seams. 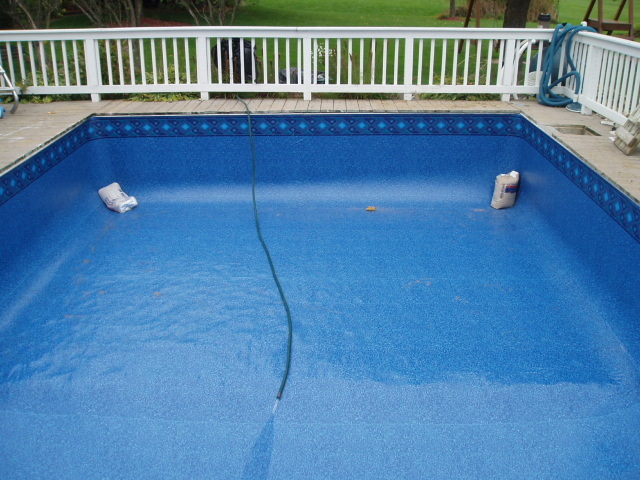 Pictured below are two more examples of highly visible liner seams on properly installed pool liners. 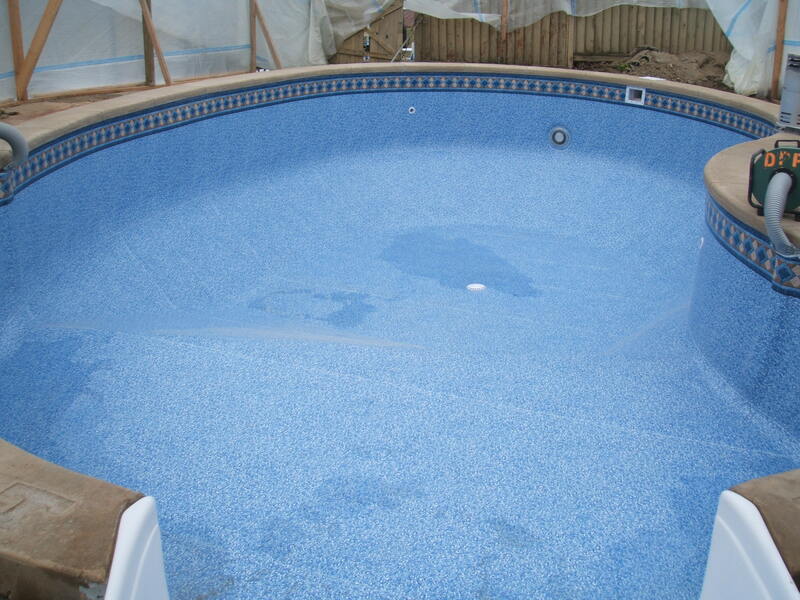 Homeowners often ask if there is any difference between a replacement vinyl liner and a liner installed with new pool kits. 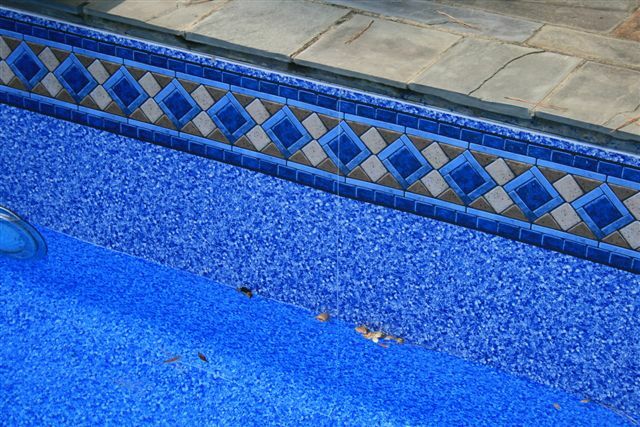 There is no difference between a liner that is made as a replacement and a liner that ships with a new pool. The materials and method of manufacturing are identical. We make liners every day for both new and existing pools and we never ask the dealer if the order is for a new or existing pool. As for the thickness of the material, you can order a 20 mil liner or a 27 mil liner for either a new or existing pool. Both are available; it just depends on the pattern or thickness you choose. For our comments on which material to choose, read further: Which liner thickness should you choose? We recently had a homeowner ask us the following question: If given the model number, can you match a pool liner pattern to a Foxx pool? This is a great question. We do have standard drawings for Foxx brand pools and we make them every day. We cannot use the model number, but we can use the drawing number if you have that. Give us whatever information you have, and we will be happy to locate a drawing if we can. In the same way, we actually have hundreds of drawings for pools by most manufacturers dating all the way back to the 1960s. The problem is, how do you know if your pool was built to the plan? This is especially true with Kidneys, Lazy Ells and Freeform shapes. The length and width may match, but what about the size of the radius turns? Even on a rectangle pool, you have to check diagonals to make sure that the pool was built square. Another problem is that years ago, we made liners by hand, and dealers would routinely over dig the pool to make the liner fit tighter. Today, with auto-cad technology, we make liners with very little “shrink” factor. Even if a stock liner fit years ago, that does not necessarily mean that it will fit today. We often tell our dealers that the fastest way to lose a few thousand dollars is to order a liner per an original drawing without taking your own measurements. This often entails using the AB method to triangulate the perimeter. The original drawing can be a good reference tool, but don’t order by it. If you do, you may be looking at liner wrinkles in your backyard for the next seven years. Always pay your local pool professional his fee to measure your pool and be responsible for getting you a liner that fits properly. Here’s a question that just came up today. One of our dealer’s reported that a homeowner’s pool turned green with algae in August, so he added algaecide. All the algae turned brown and fell to the floor, like it is supposed to, but when he vacuumed it up he had brown stains left in certain areas. The stains are the same light brown color as the dead algae but appear to be glued to the liner and are rough to the touch. He tried scrubbing and rubbing, but nothing would remove these stains. As soon as I saw the photo (see below) it confirmed what I suspected. Pool Goo or Pool Tar. I recognized it because the same thing happened to my dad’s pool a few years ago. The good news is that “pool tar” is not a big problem. It will resolve itself given time. As you can read below in a report from a vinyl manufacturer, plasticizer has come out of the vinyl. 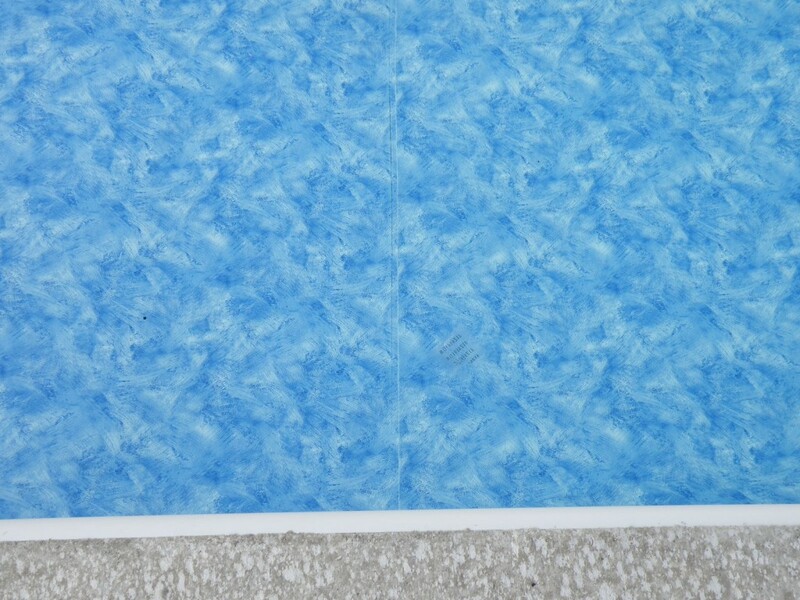 It is a sticky, gooey substance that attracts whatever dirt is in the pool and over time, under normal operation, the material is re-absorbed into the vinyl and the stains appear to vanish. I think it may have taken six months to clear up on my dad’s liner, but it does go away. I usually hear about this showing up when the pool is opened in the spring. That makes a lot of sense in that most winterizing kits contain algaecide, and that combined with a high chlorine level seems to create the problem. Do not try to remove the stain aggressively; this may permanently damage the liner. Just give it time. * The following article comes from the Technical Manual of Canadian General-Tower Limited, a manufacturer of the vinyl sheet used to make pool liners. 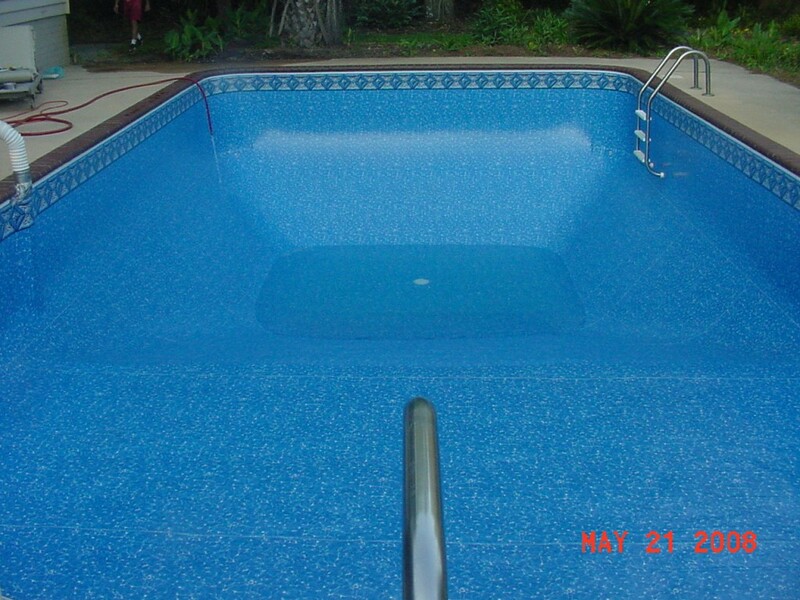 The consensus in the pool industry is that there are several sources of sticky substances, often referred to as “pool goo” or “pool tar” that adhere to and coat portions of the vinyl pool liner. 1. Algaecide-humate or Quat-humate formed from the interaction of quaternary ammonum compound used in some algaecides and decaying organic material such as leaves, grass, insects, etc. 2. Interaction of quat algaecides with other substances. Even chlorine can interact with quats to form sticky material if both chlorine and algaecide exceed the recommended dosage levels. Quats can easily come in contact with high chlorine levels in automatic chlorinators, resulting in a gummy material gradually being fed into the pool, where it eventually precipitates on the liner. Many quat containers are labelled with cautionary notes warning against mixing with pool water having high chlorine concentrations. 3. Chlorinator goo can form when organic material from cosmetics, tanning lotions, etc. are oxidized by high chlorine concentrations resulting in a beige, waxy material. 4. A light coating of vinyl plasticizer may exude to the surface of newly installed liners during the first idle period of winterization. This material is clear and only turns dark if contaminated with dirt. It is attributed to lack of circulation, since it has never been observed in a pool that has been circulated over the winter. It will almost always re-absorb in two or three weeks if the water is allowed to warm up and is circulated and shocked with chlorine every couple of days. The problem is not known to occur more than once in the life of a liner and always the first time the pool is re-opened after winterization. 5. Pool scum is a ring that forms aroudn the pool at the water line and is made up of soil, contaminants from suntan lotion, environmental pollution, and organic materials from bather load, etc. The following procedure has been recommended by experts in the pool industry as being effective in eliminating “pool goo” or “pool tar” problems. 1. Stop using quaternary algaecides. 2. Reduce and maintain pH at 7.0 – 7.2. 3. Superchlorinate every other day to 6.0 – 8.0 ppm. 4. Use heater to speed up warming of water, if available. 5. Continue to circulate water and monitor pressure on filter. 6. Backwash filter as often as required. Oftentimes people ask us which liner material is “better:” the 20 mil or the 27 mil? In reality, there is no “better” liner. The most important choice is not the thickness of the material, but the liner pattern that you choose. Choose the vinyl liner pattern that you like the best. If it comes in 27 mil at no extra charge, take it, but don’t pay extra for it. You shouldn’t pass on your first pattern choice just to get the thicker material. In our opinion, there is no meaningful advantage to thicker material. There is no difference in wear, durability, longevity or warranty. Liners fail for two reasons. The ink fades or the material dry rots above the waterline. Thicker material solves neither of these problems. Most importantly, choose a vinyl liner pattern that speaks to you. You are going to be looking at that pattern in your backyard for at least the next seven years. Ultimately, the pattern you choose should outweigh the thickness of your liner material. It is what you think looks the best that matters. Here at McEwen Industries, we are always searching for new ways to educate our dealers and consumers about issues in the inground pool liner industry. 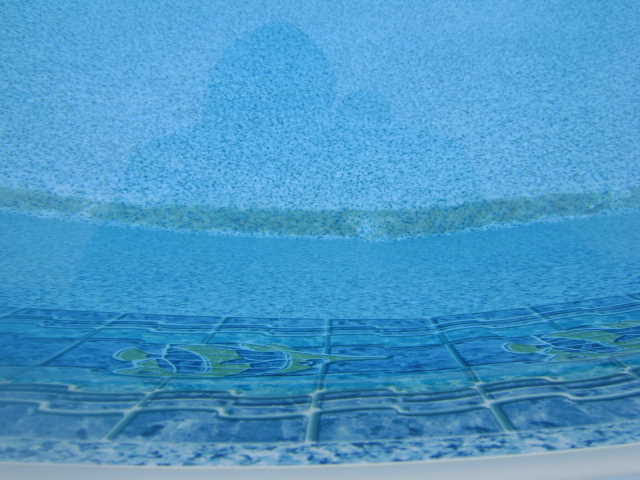 We have developed this blog as an interactive forum between our company, our dealers, and current and prospective pool owners – a place to discover and discuss hints and tips regarding inground pool liners. 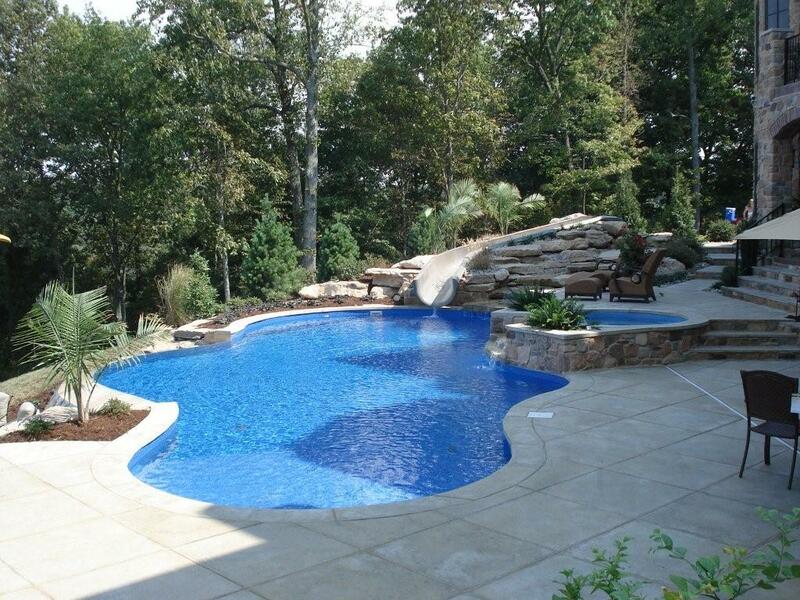 McEwen Industries supplies quality pool products to professionals in the swimming pool industry. While we love working with swimming pool dealers, we look forward to sharing our pool liner knowledge to those not in the industry. 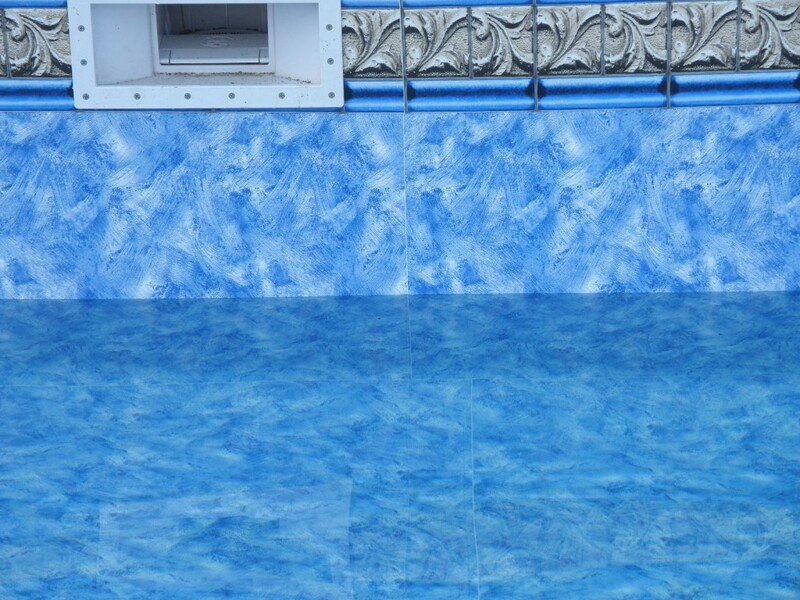 Within this blog, we will concentrate on the homeowners looking to purchase a vinyl pool liner or homeowners looking for tips to maintain or replace their current pool liner. We take pride in our extensive swimming pool knowledge and expertise, and we want you to be in the know as well. Please stop by from time to time to check out our latest post. We will continually update our blog and keep it swimming with an abundance of useful information. We appreciate your interest in inground pool liners and look forward to keeping you updated. Please feel free to leave comments and ask us any questions that you might have.